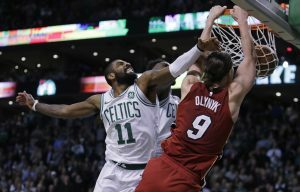 BOSTON — Kelly Olynyk scored a career-high 32 points in his rousing return to Boston, and the undermanned Miami Heat hung on Wednesday for a 90-89 victory over the Celtics. On a night when the Celtics honored their former forward in his first game back, the popular Olynyk received a standing ovation from Boston fans and led the Heat (16-15) to another win against the top team in the Eastern Conference. Josh Richardson had 19 points and six assists for Miami, which took two of three in the season series. The Heat ended Boston’s 16-game winning streak earlier this season with a victory at home. Olynyk signed with Miami as a free agent during the offseason. His previous high was 30 points on Dec. 15, 2014. When this one was over, he took photos with fans. Kyrie Irving paced the Celtics (26-8) with 33 points, but missed a jumper from the right wing that bounced off the rim at the buzzer. Jaylen Brown scored 16 and Marcus Smart had 15. Boston big man Al Horford went 2 for 10 from the floor with eight rebounds and fouled out with 8:14 to play. Miami led 87-76 with 2 1/2 minutes left before Irving sparked a 13-3 run with nine points. Miami pulled out to a 71-60 lead when Olynyk drained consecutive 3-pointers in front of Boston’s bench with just under 10 minutes to go. The Celtics sliced it to 79-75, but Richardson converted a three-point play and Olynyk nailed a 3 on consecutive possessions with less than five minutes left. The Heat went on a 15-2 run midway through the third quarter, taking their first lead and building a 58-51 advantage on Bam Adebayo’s one-handed flip in the lane. Heat: G Goran Dragic missed his second straight game with a sore left elbow and F Justise Winslow sat out his fourth in a row with strained left knee. It was the second consecutive game in which the Heat were missing six players due to injuries. … The Heat were called for delay of game because they weren’t on the court quickly enough to start the second half. Celtics: Jayson Tatum dislocated his right pinkie when it was stepped on after he dove for a loose ball in the opening minutes. He went straight to the locker room, but returned late in the first quarter. … F Daniel Theis played with a mask after surgery for a broken nose Tuesday. . F Guerschon Yabusele pretends to shoot an arrow and does a “dab” after he hits a 3. The Celtics honored Olynyk as the “Hero Among Us” for doing more than 100 community appearances and helping raise thousands of dollars for their charity when he was with the team. There was a brief video of Olynyk doing events and he was given a standing ovation early in the second quarter. The teams combined to miss 24 shots in the second quarter — with both under 39 percent — and went long stretches without a basket. Heat: Host the Dallas Mavericks on Friday in the opener of a four-game homestand. Celtics: At the New York Knicks on Thursday.